During the Vietnam War, a photojournalist named Eddie Adams took a photograph. You’ve probably seen it. There is no disagreement on the contents of the photograph. ARVN Brigadier General Nguyễn Ngọc Loan is holding a .38 snub-nose revolver to the head of a prisoner, and the photograph is mid-execution. The bullet is literally traveling through the prisoner’s head at the moment of exposure. This is a snuff photograph. And that’s all the photograph shows. Everything beyond it is either our projection on the contents, or what we’ve researched about the context. Most people think this photograph shows the brutality and corruption of the ARVN. But a little historical study shows things are really quite a bit different than one is led to believe from this photograph. Let’s start with the condemned. Let’s start by giving him a name, a past, a history — not one made up from whole cloth, but his real-life history, what you can discover for yourself in a trip to the library. He was Nguyễn Văn Lém, and a captain in the Viet Cong insurgency. 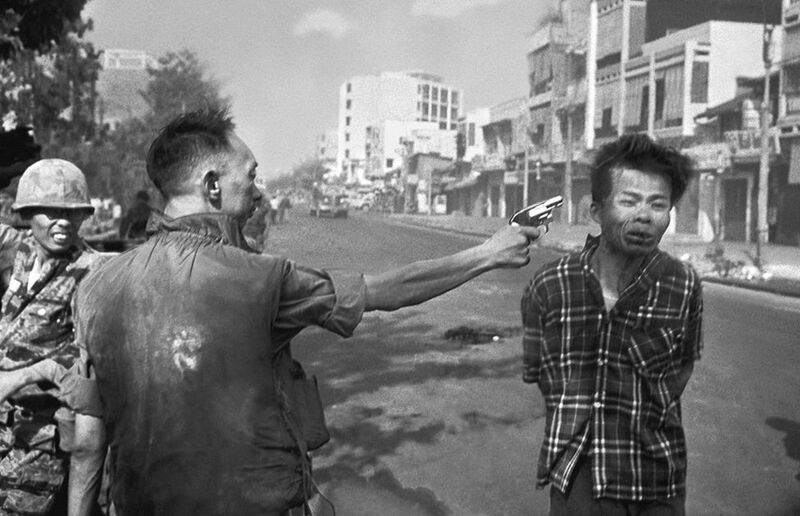 He was thirty-six years old when this photograph was taken, in the middle of the Tet Offensive. So far that day Nguyễn Văn Lém had murdered an ARVN officer, the officer’s wife, their six children, and the officer’s eighty-year-old mother. The Geneva Accords give insurgents strong protections so long as they abide by what are called the Laws of Armed Combat (sometimes called the Laws of War). They must, among other things, wear an identifiable uniform and take measures to limit civilian deaths. If insurgents break these rules they are considered beyond the protections of the Accords and are subject to summary execution when found. Nguyễn Văn Lém was wearing civilian clothing during the Tet Offensive, and rather than trying to limit civilian casualties slit the throats of two noncombatant women and six children. He was positively identified as a captain in the Viet Cong, was correctly identified as the perpetrator of eight murders that day, and received summary execution. Moral of the story: don’t murder in a war zone. Or we can, you know, say “I’ve seen all I need to see, the photograph says it all!”, and believe whatever we want to project on the photograph without needing to do any inquiry into the facts surrounding the images: what brought those two men to that point in time and what led one man to decide another ought die in that instant. Why do I bring this up? Because increasingly we as a society are jumping onto outrage bandwagons based on brief snippets of video — devoid of context, devoid of inquiry, devoid of sober reflection. We see what we see and we project wildly onto what we see, and we consider ourselves to be morally just for doing it. I don’t see much justice in it, though. If you don’t believe me, ask Eddie Adams. He received the Pulitzer Prize in 1969 for that photograph, but later on apologized to General Loan for the damage it did to the man’s reputation. Adams was a good photographer who only aimed to provide searing evidence of a moment in time, but lived to see his truthful testimony of an instant used to destroy a man’s character. General Loan, who by this time was living in the United States, graciously accepted the apology. Adams and Loan spent the rest of their days as friends. Well TIL about summary execution in war. But that being said, how is this also not an arguable horror of war? The necessity or legality for brutal actions like this, even if they’re understandable, legal, and justifiable seem heart wrenching. It might be just, or unjust, but it doesn’t seem good. There’s certainly a case to be made that all war is horror and that all war is legalized murder. I just dispute that this is a special or exceptional case of it. Vietcong infiltrator murders eight noncombatants in violation of the Laws of War, receives a summary trial and immediate execution. News at eleven.